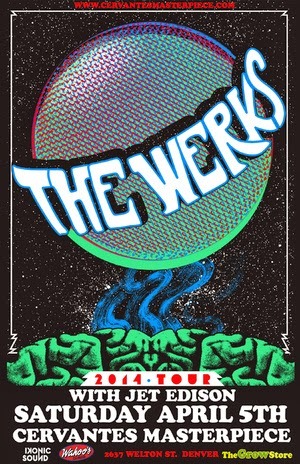 Dance Party Alert: “Phychedelic Dance Rock” group The Werks is coming for you Colorado! The foursome will be starting their four night run in Breckenridge at Three20south and then heading over to Fort Collins for night two at the Aggie Theatre. Night three will be in Boulder at the Fox Theatre and finish up with the fourth night in Denver at Cervantes’ Masterpiece Ballroom. Formed in 2007, The Werks quickly developed into a national jam band powerhouse. The Werks produce music that can be appreciated by countless, diverse musical tastes. Known for their musical ingenuity, The Werks utilizes numerous genres of music across the board - fusing psychedelic shredding guitars with funky slap bass, synthesizers, and modern dance rhythm. Relying on the energy of the audience to determine the flow of the show, along with the unique performance style, The Werks bring on stage, it is certain that each show will be unforgettable. Tickets can be purchased through http://thewerksmusic.com/. Get down Colorado! Secret Panda Society - "Kaleidoscope EP"